My name is Renee and I was born in Michigan and have lived in Muskegon since I was 5. I have 2 wonderful children and 2 grandchildren. I am married to the kindest man (it’s been 42 years!). I love living along the lakeshore. I love all things vintage. I have loved opening a shoppe with my daughter, and I also used to own a shoppe with my sister, Suzette. 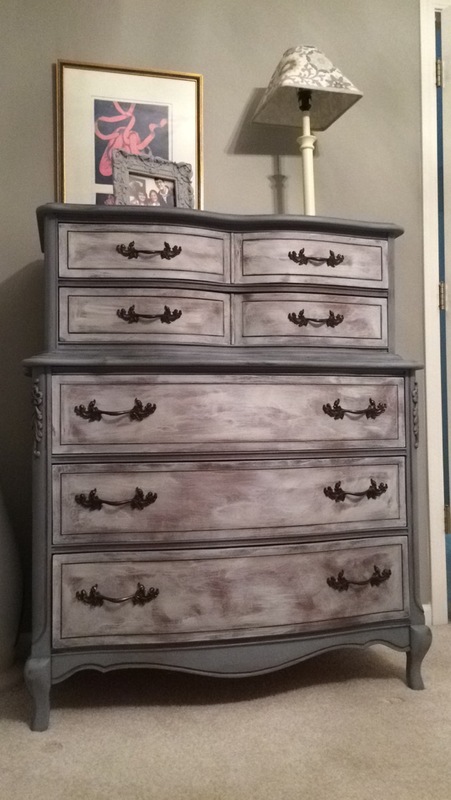 The love of painting runs in my family- I like to paint furniture, my mother was an established artist and my sister is following in her footsteps. Deep down inside, I wish I could paint like them. I love visiting my son, daughter-in-law and granddaughter in New York. It’s one of my favorite places. One of my favorite things about owning a shoppe is I can go junking for miles and miles and have a place to put all of my treasures! We’ve had some epic junking trips! My perfect day would be spending time with my granddaughters. I am fortunate to have great family and friends! Happy birthday, Mom! I (Courtney) will add that my mom is one of the hardest working women I know. She is creative, kind, funny and strong. Many people find themselves saying negative things about ending up like their parents, but I am the opposite. I hope I end up like mine! Love you Mom!! You are invited to our Grand Opening Celebration! There will be a ribbon cutting ceremony at 11:00am, Friday, June 2 and the store will feature extended hours (From 11:00am-9:00pm). We hope to see you there!! Today is not really my birthday. My birthday is March 15. Every year I have to think really hard about how old I am. It gets harder and harder to remember. In my family, we don’t just celebrate one day- we kind of like to do an entire week of celebrating someone. For my birthday dinner, I did not go to Qdoba, I went to a local restaurant that more members of my family can enjoy. Speaking of my family, I am the luckiest. I got the sweetest video message from my daughter wishing me a happy birthday. Birthdays seem to go faster now that I have a child. My biggest regret is that there will never be enough time to just be with my daughter and my family. It will never be enough. Period. I wish I could write about all of my family members, but I particularly wanted to mention my mom. She’s the best. Not only has she loved me unconditionally my entire life (even at times when it was hard to do), she is also my biggest supporter. She and I started a vintage business in 2012 that has led us to create many fun memories. You’ll be able to get to know her more when we do a post like this for her in September! I am anticipating some major changes in my life soon and I am anxious. …this image. I recently saw this online and it immediately quieted my soul. Speaking of praying, one of my prayers already came true! A friend of mine underwent a very serious surgery this week and she made it through and is now on the other side of her recovery. It is going to be a long road, but I am going to keep praying. I love to read. I don’t get to do it as often as I like, but I still enjoy it. I am currently reading Life After Picasso by Francoise Gilot. My daughter found it in a stack of my Grandmother’s books at my parent’s house and brought it to our house. My Grandmother got it when she went to a luncheon with the author. It’s special because Madame Gilot signed it to her. It’s fun to read about the lives of artists in the 30s and 40s. I imagine people like Picasso and Matisse meeting each other and having lively, passionate conversations. My Grandmother was an artist and she had a lot of passion for painting and making prints. She was also fun to talk to. I did not get much of the ‘artist gene’ but I recently decided to not let that stop me. It just means my medium is different. 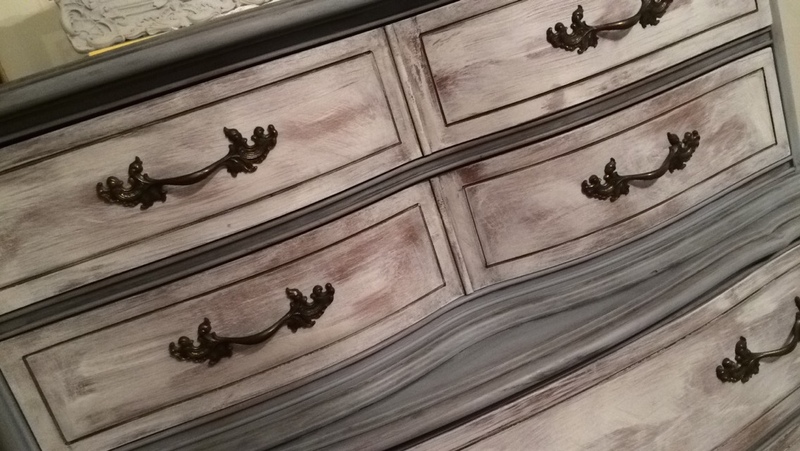 I am an artist of painted furniture (at least that’s what I tell myself). I am also attempting to hand letter. It’s kind of relaxing, but I really need to practice. I’m going to start here. I am craving a vacation- big time! My husband and I tried to do a kid-free vacay to Vegas last month and I ended up in the hotel room the whole time with the stomach flu. Terrible and sad! I watched a lot of Netflix and TV. I don’t usually watch much TV, but I can’t get enough of This is Us. It gets me everytime. Like, seriously gets me. I like it when people handwrite notes inside birthday cards. My mother-in-law is the best about putting a piece of handwritten scripture in all of our cards. It always makes me feel good and encouraged. I want to be better about sending handwritten birthday cards so that they make it to people on time. I ordered Christmas cards this past year, complete with a nice picture of our family, was looking forward to sending them out, and then just completely lost steam. It’s hard working all day, mom-ing as soon as you get home, finding time to work out, keep the house clean, make dinner and pursue a business on the side. I often feel like there is not enough time in a day and then I wake up just to do it all over again the next day. Adulting = difficult. One annoying thing about adulting? Cleaning. It’s all I ever do. <cue dramatic voice> But it has become much more enjoyable since I recently joined Grove. They have some really nice cleaning products. I got a spray for my granite counters and I love it! Here is my affiliate link if you are interested. 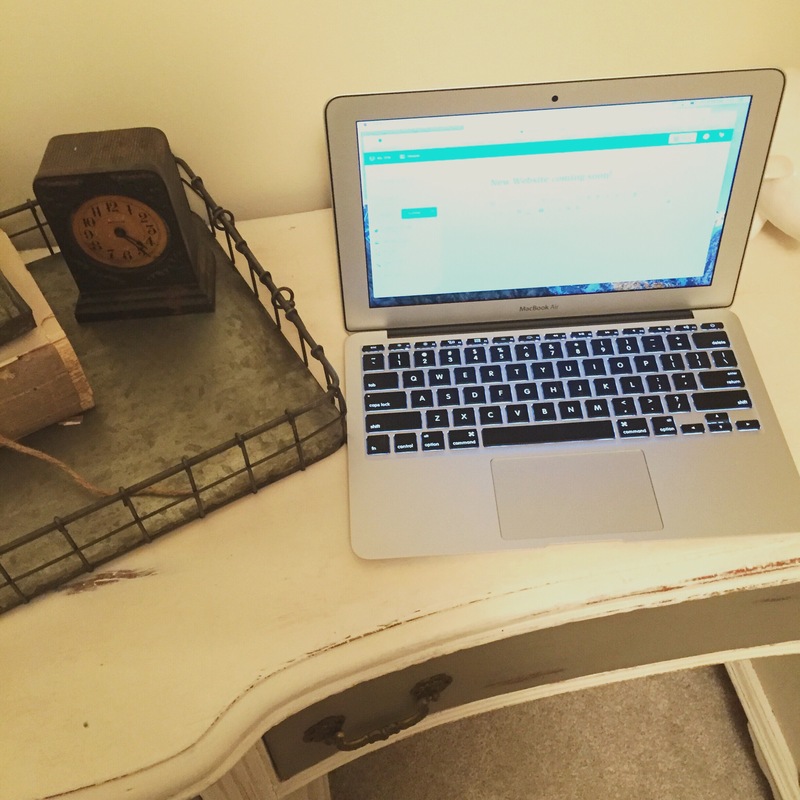 I meant to post this blog post on Wednesday (my actual birthday), but life got in the way! It’s pretty normal for me to be running late or a bit behind. I am trying really hard this year to be better about honoring time and getting where I need to be with the right amount of time. That takes work! My husband has been working really hard lately. He is such a good guy! He is so supportive of me and my endeavors. He’s been working non-stop these past few weekends on a project I put him up to (reveal coming soon). Not to mention, he is really patient with me when I have to ask him all the time how many quarters are in college basketball. (For the record, there are only two halves.). Some day I’ll get it right! Go MSU! I thought I would have trouble making it to 35 things… so close! We are working hard to bring you a lovely new website. We can’t wait to show you!! Until then, please find us on Facebook and follow us on Instagram for updates! What child doesn’t like a fort? My daughter has recently been into forts and picnics, so we decided to make her the best way to enjoy both- a teepee!! 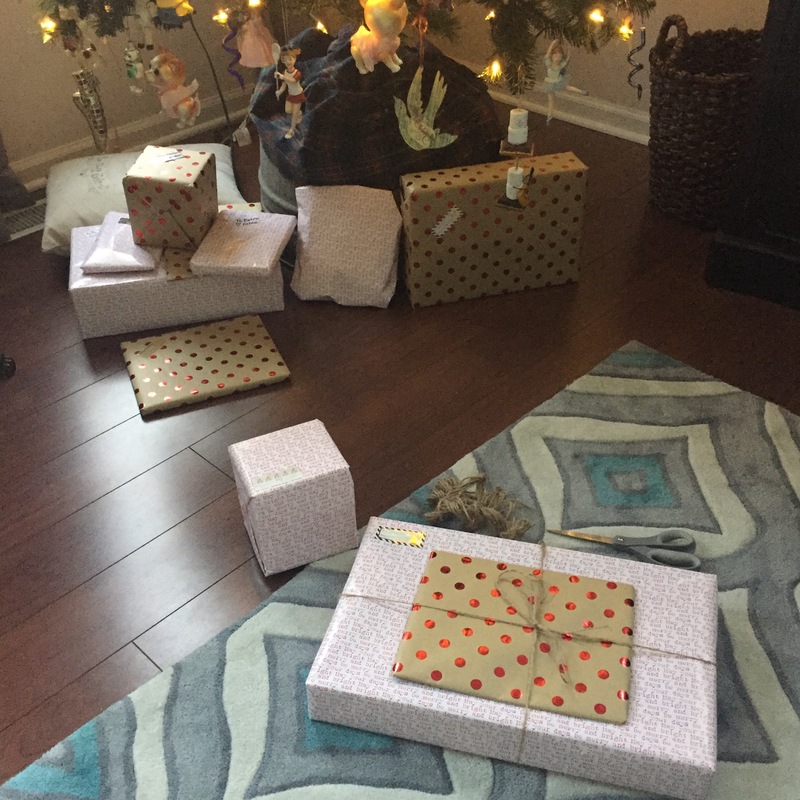 In fact, we liked the idea so much, that my mom even made one (with a twist) for her house that both grandchildren will enjoy for years to come!!! If you’ve been on Pinterest, it seems like every year, this idea circulates. So, like any great idea, we consulted Pinterest and found this tutorial from Project Nursery. We followed her measurements and also created ours to be collapsable, but while hers is no-sew, we opted to sew the hems. That is about all I can handle as far as sewing goes and it wasn’t that bad! 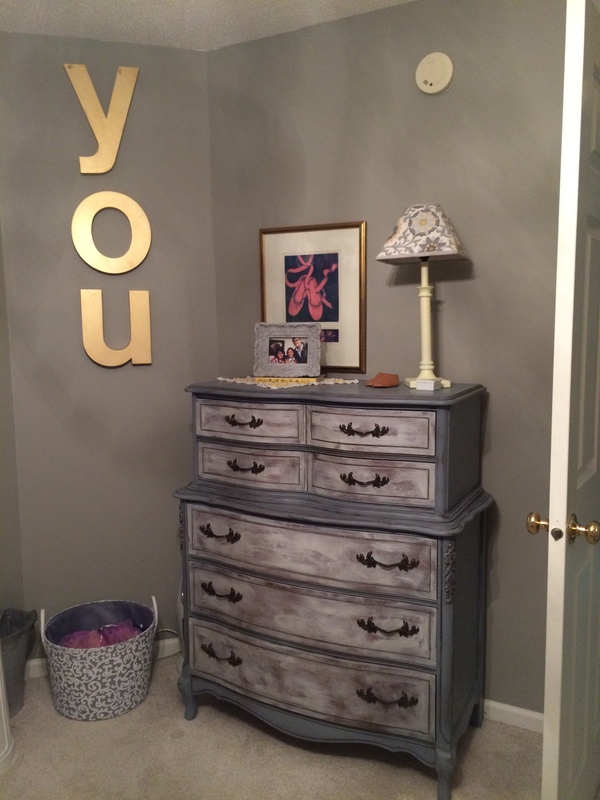 We also modified hers and instead of using contact paper to cover the PVC pipes (it seemed too hard), we opted for our addiction instead and used, well, chalk paint, of course! We painted the PVC pipes in Vintage Market and Design Furniture Paint in the color Burlap. I opted to leave the teepee for my house unpainted. (I couldn’t decide on a color!) (I should have painted it.) (I can change my mind.) My mom opted to paint her teepee in Duck Egg. Oh la la! Let me tell you, it turned out amazing!!! The granddaughters are going to love this!! Happy Christmas Eve Eve! I wanted to quickly share with you an idea I had to cover the base of my Christmas tree. 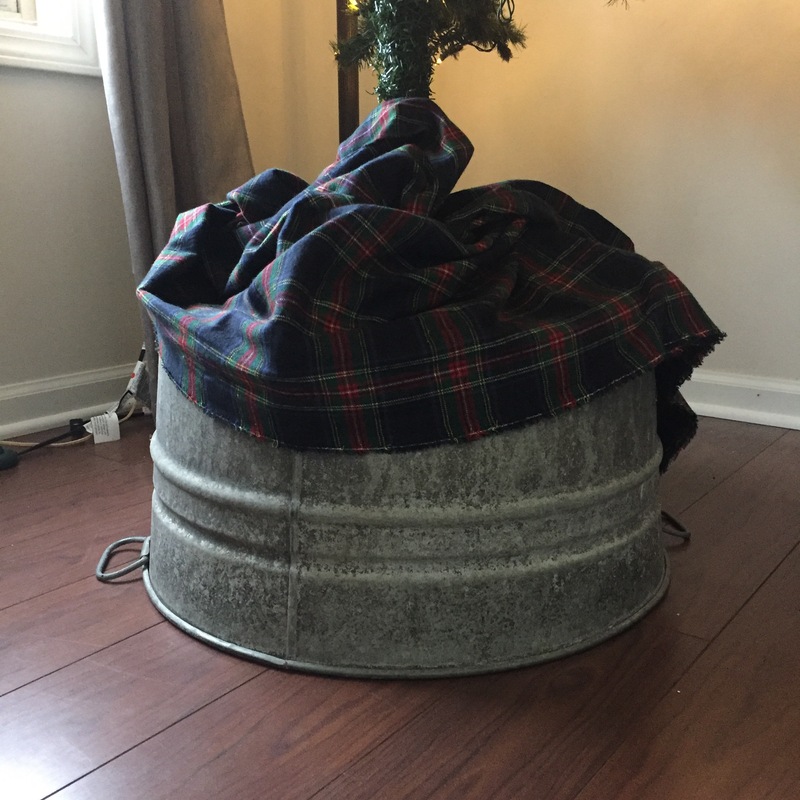 I really wanted my Christmas tree stand to fit inside the vintage bucket, and I thought that it would, but when it came down to it, my base was just too big (or the bucket was too small)! 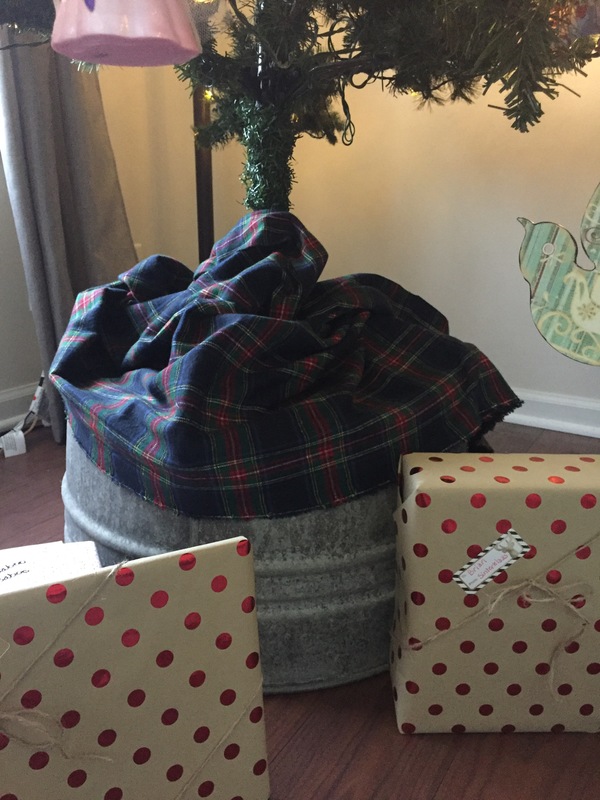 So I did the next best thing any mother of a three-year-old would do, I precariously propped my entire Christmas tree on top of the inverted vintage metal bucket. The problem is, it did nothing to hide the ugly stand. 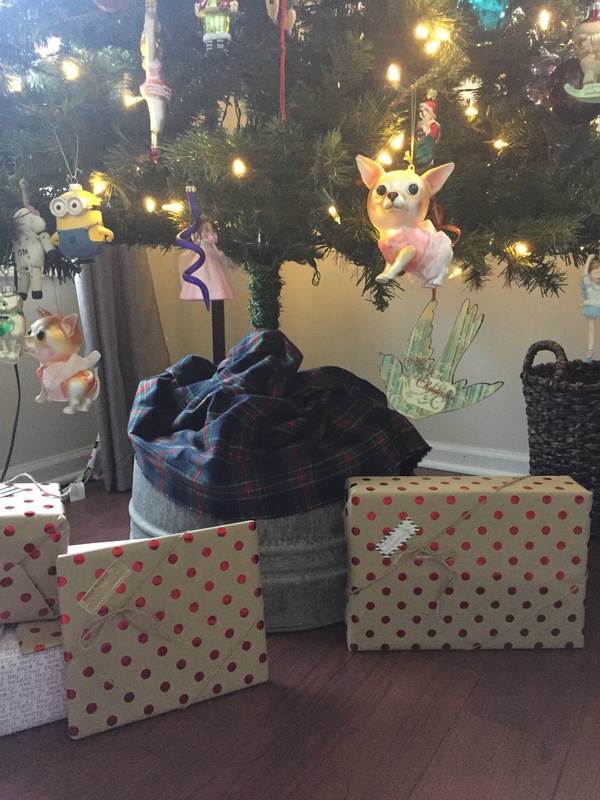 I had just bought some pretty plaid fabric for a different project I was working on, and had some left over, so I simply wrapped it around the base of the Christmas tree. Problem solved. I love the way it gives it a kind of rustic meets farmhouse look. Merry Christmas! At the time, I knew I wanted to paint it. (I paint everything.) I was also in a phase where I wanted to embrace some of the gold fixtures in my house. 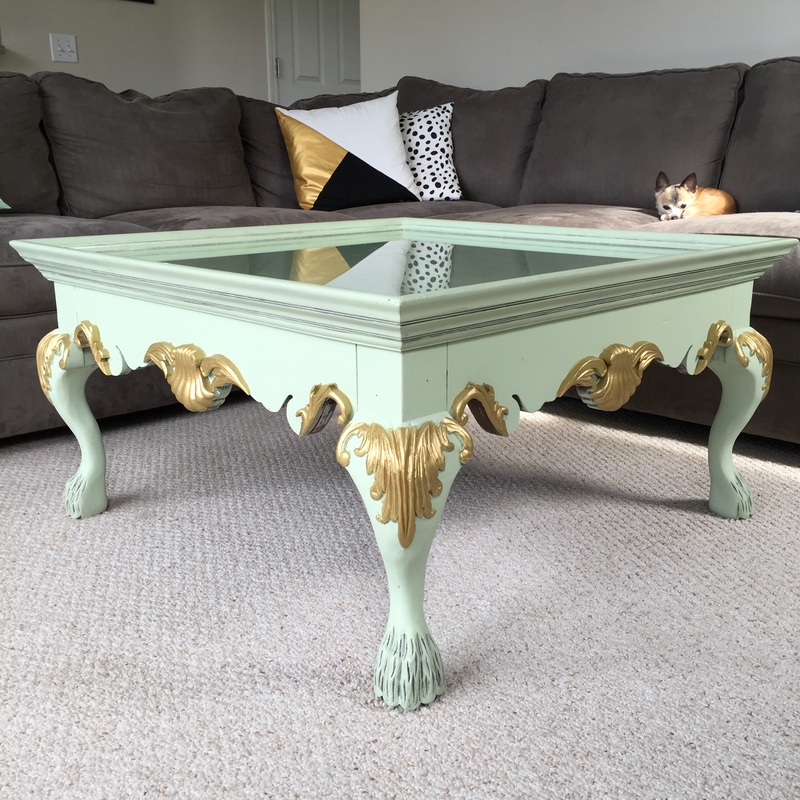 So, I took a chance and painted her in Vintage Market and Design Furniture Paint Mint. I finished her with some cast iron crowning touch, clear wax and clear coat sealer. The gold was just some gold craft paint added to the beautiful details. 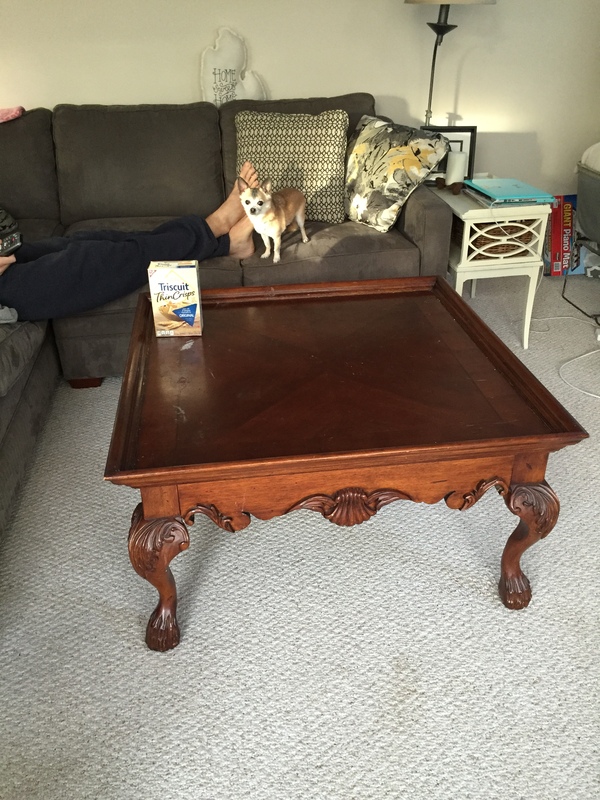 My table stayed like that for almost two years. I wanted SO badly to be that person that has the pop of color furniture piece, but it just wasn’t right. I enjoyed it, and people complimented it, but I could never fully commit to the color in that room, and then my design choices changed. So, I decided to repaint it. 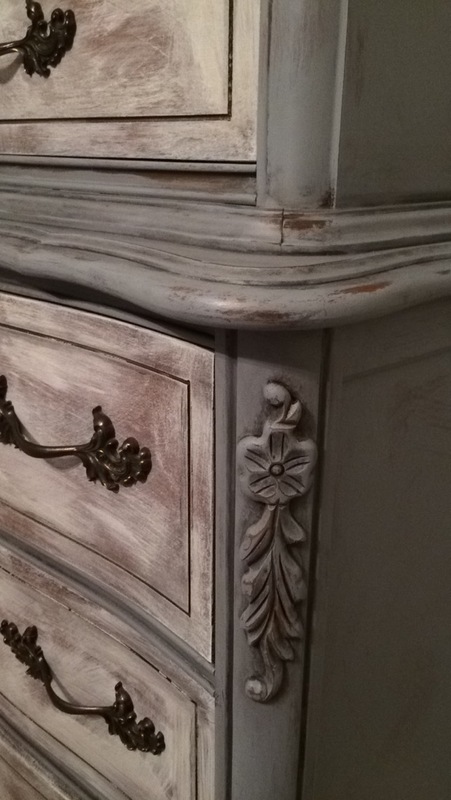 Vintage Market and Design Furniture Paint in Cotton, Chateau and Cast Iron Crowning Touch. Let me say, ooh la la! The detail work pops in all the right places! I am officially in love. This is how it will stay (for at least the next two years, right??). What do you think? Hi there! I know the big box stores already have had their holiday stuff out for awhile, but for me, I know we’ve hit holiday season once the Mona Shores Holiday Arts and Crafts Show rolls around. I can feel the warmth of all the shoppers milling about, hear the holiday music and smell the glitter- wait, what? Yeah, there’s usually glitter everywhere. We have been busy getting some lovely holiday decor ready! There’s more to come, but I wanted to give you a sneak peek! Hope to see you there November 5!